Fab Food Saver / Storage Containers from the 70s or 80s. However despite this, the odd small mark etc could be missed. I describe every item as best I can and we point out any significant imperfections that have been identified. 2 - 10 oz. Servalier Bowls with Matching Seals #1323 #812. The Little Wonder Bowls are great for cereal,fruit,snacks and. Lids are an A size. Color: blue,white,peach,green,yellow and pink. This set of bowl are in like new condition. 7 Single Salad Bowls. 2 Large Salad Bowl With Lid. We also have the Deluxe Salad Set, which is 17 cup with tongs and 4 @ 2-cup salad bowls and coordinating seals. This is the Impressions 18 cup salad bowl in blue, with a blue seal. It includes 12" long salad tongs (2 piece-tongs). 8" ACROSS THE TOP NOT INCLUDING THE STAY COOL HANDLES. THE LID #2526 DOUBLES AS A PLATE. THE LID IS #2528. THE CHAIR IN THE PICTURE IS NOT FOR SALE. Gelatin Bowl with ONLY the tulip mold. Single wedge Pie keeper. 12" Round Pie Keeper Container. Ice Cream Keeper with pull out tray. Lids fit tightly, no cracks, not brittle, color is bright. THE BASES ARE WHITE AND THE LIDS ARE BLUE - THEY HAVE THE PUSH BUTTON STYLE LIDS AND ARE IN EXCELLENT CONDITION AND CLEAN. 6 Servalier Storage Bowls. Container Item #886 and Lid #812. Lids are fine! Only 2 Lids! 234 235 236 237 No Lid. It is in excellent condition and has seen little use. Get this hard to find item while you can. Includes 788-7 Container, 787-7 Grater, 230-8 Snap-On Lid Fits Tight. Bowl Is Approx. 9" Across x 3" Deep. Jadeite Green Color, Light Scratches As To Be Expected From Use. No marks or stains on bowls and caddy. They are in good pre-owned condition. The base and bowl can be separated for easy storage and cleaning. Lid # 733-19, bowl # 754-9. The bowl attaches to the tray and spins. The lid has scratches (see photo). Tupperware Servalier Bowls. Storage Snack Containers. Olive Green with Matching Seals. SET OF THREE. "". 'NEW""' RARE. NOTHING IS FROM A GARAGE OR ESTATE SALE. They are preowned but I'm sure they have never been used. There are two sets of three, one set is still wrapped in the original plastic wrap. Again these look like they have never been used, the blue one in the opened set has a few scuffs from being stacked. Tupperware Pudding. Smokey Gray Bowls. EXTRA INFORMATION. Tupperware 3 piece set Roast Flavor Saver. Large oval shaped bowl with rack and lid in sheer. Base: Tupperware 754 - 19 / 23 / 22 / 24. Local pick up is available from Mount Waverley Victoria. Each bowl consists of two pieces to make storage easier. 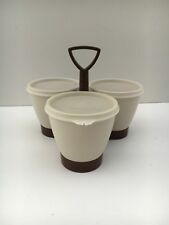 Vintage Tupperware Harvest Gold Condiment Caddy Set, 3 Bowls, Lids, Nice! This is the harvest gold and beige model. Includes the caddy, three bowls and three lids. All are in very good condition. No burns, odors or stains. Slight signs of wear from use. Lids fit tightly. Canisters are preowned, in great condition. Set includes. 4 Vintage TUPPERWARE #1405 Harvest Colors Wonder Cereal Bowls Set Quick Ship! Clean pre owned condition. Yellow has a little more interior marks. Colors of orange, yellow, burnt red and paprika. Photo color may differ due to lighting. There are no lids to this set, sorry. One large bowl, 5 salad bowls and 2 serving utensils. Item: 2 Tupperware cereal bowls with lids. Materials: Hard plastic. Set contains base, 3 bowls with lids and 3 serving spoons. No stains or odors, covers fit nicely. This set has not been used much, Great condition! The jello mold has 2 seals, 1 for the top and 1 for the bottom. The 2 white bowls are very used and show several scratches & wear, both seals are tight. I have a truckload of tupperware to list be sure to check them out.